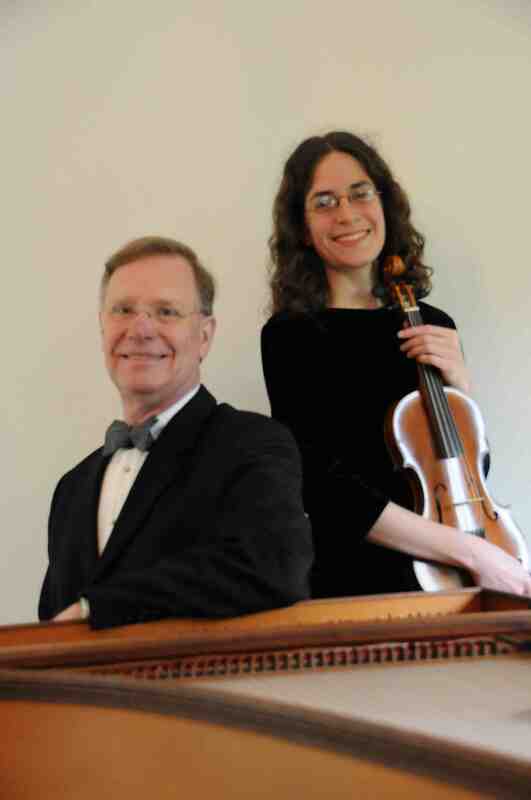 Just before they left Madison, the early music ensemble SDG – it consists of baroque violinist Edith Hines and UW keyboardist John Chappell Stowe (below, in a photo by Katrin Talbot) — gave a concert that was reviewed for this blog by John W. Barker. I then asked Edith if she and John would be guest bloggers and write-up their participation in the Boston Early Music Festival and compare it to the Madison Early Music Festival, in which both will participate. So here it is – right on the cusp of the Madison Early Music Festival, which runs July 9-16 and will explore early music (Renaissance and Baroque) in the New World. And it speaks well of the early music talent that is trained and teaches in Madison at the UW. Last month, Ensemble SDG had the privilege to attend the Boston Early Music Festival, “Metamorphoses: Change and Transformation,” held June 12–19 in various venues around the city. We had two primary responsibilities: first, to perform our program “Play It Again, Johann: Variations and Revisions in Music of Germany, 1660–1730” as part of the BEMF Fringe Concert Series; and second, to represent the Madison Early Music Festival during the BEMF Exhibition, held June 15–18. The Boston Early Music Festival consists largely of a theme-coordinated concert series of very high quality and an Exhibition (about which we write below); the BEMF Fringe Concert Series is designed to complement the Festival concert series. Since weekday Festival concerts never begin before 5 p.m., soloists or ensembles not performing in the Festival proper may arrange their own daytime performances and receive publicity through the BEMF website and Yearbook (program book and performer/exhibitor directory). 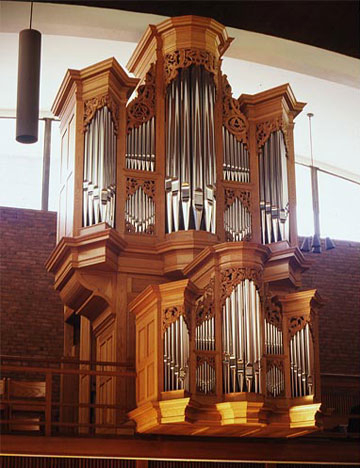 Ensemble SDG performed on Monday, June 13, at First Lutheran Church with the church’s excellent historical-style organ (below), which was built in 2000 by Richards, Fowkes & Company following high-Baroque north German models. This instrument was a delight to work with, having a wide variety of stops from which to select registrations that were musically appropriate for the repertoire we had programmed. Unfortunately, however, playing an unfamiliar organ is not like playing an unfamiliar piano—even organs of similar styles have very different musical attributes—and we did not have quite as much time as we would have liked to become acquainted with the instrument, the physical setup of the church balcony, or the acoustical idiosyncrasies of the building. Nonetheless, the recital came off with reasonable success, with several people commenting on the “hidden gems” of the first half of the program (an anonymous sonata/passacaglia, a Schmelzer sonata, and a chorale fantasia on “Wie schön leuchtet der Morgenstern”). We were thrilled to see some musical luminaries in our audience, including Edith Ho, former Director of Music at Church of the Advent in Boston, and Simon Carrington, distinguished conductor and former member of the King’s Singers. From Wednesday to Saturday, our days were occupied with the BEMF Exhibition, at which instrument makers, publishing houses (including A-R Editions of Middleton), educational institutions, and other organizations from all over the world gather to display their materials and to make professional contacts. We frequently made the point to our visitors that MEMF is an annual festival (unlike the biennial BEMF) and, therefore, they should at least consider us for next year! Several Midwesterners were happy to hear of an early music festival near them, and a handful of students were interested in the opportunity to be a student assistant in exchange for reduced tuition. At the table we also had the chance to meet interesting professionals in the early music field and to renew contact with many acquaintances who stopped to talk with us. The BEMF concert series includes 16 performances that are offered from mid-afternoon to late at night (11:15 p.m. concerts! 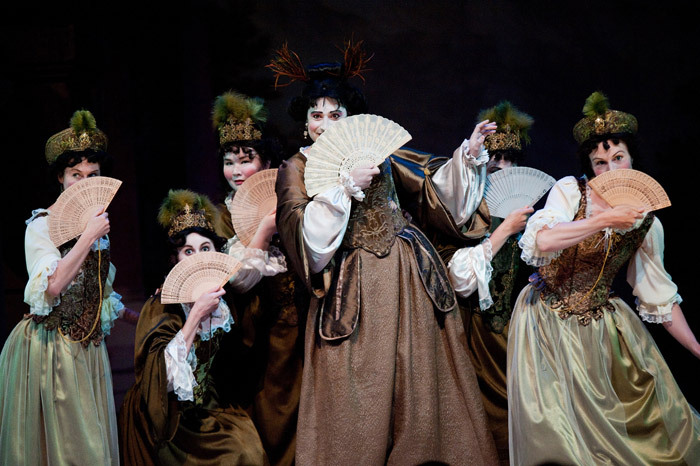 ), but the centerpiece of BEMF is the opera (performed five times), which this year was “Niobe, Regina de Tebe” (Niobe, Queen of Thebes) by Agostino Steffani. 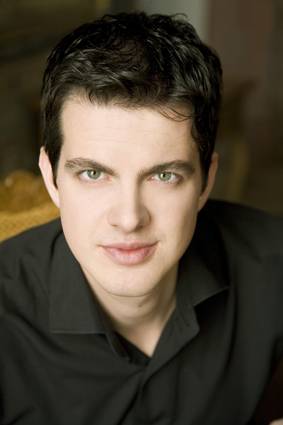 The Festival assembled a stellar cast, headed by soprano Amanda Forsythe (below top) and countertenor Philippe Jaroussky (below bottom), as well as an orchestra of nationally and internationally renowned instrumentalists. One member of the cast was countertenor José Lemos (below), who will be performing and teaching at MEMF 2011 (below, Lemos as Nerea, the comic nurse), and many orchestra members would have been familiar names to MEMF participants. The team of directors produced an elaborate spectacle historically informed in nearly every respect, from the pitch level (a’ = 392, a whole step below modern pitch) and the orchestral setup (the two violin sections facing each other across a straight row of stands) to the theatrical gestures, curving paths to exit the stage, and dance choreographies; from the elaborate costumes and sets (flat-panel backdrops, but effectively arranged to fill the whole depth of the stage) to the stage machinery (flying clouds and dragons—operated, however, by electricity, and including [discreet] seatbelts per OSHA standards!). The stage director, Gilbert Blin, was assisted by Ellen Hargis, who served as “gesture coach,” enhancing the production with the artifices of posture and body language that were so important to seventeenth-century theater and who has performed at MEMF. The story itself, based on Ovid’s Metamorphoses, was rather insipid, but the musical setting was full of catchy dance rhythms and had some stunning moments, including unexpected chromatic turns and one incredibly mesmerizing aria in which Anfione (Niobe’s husband, King of Thebes) contemplates the harmony of the spheres. Time and budget did not allow us to attend every concert, though among the Fringe Concerts we were able to hear a concert by the Case Western Reserve University/Cleveland Institute of Music Baroque Orchestra (very impressive intonation! 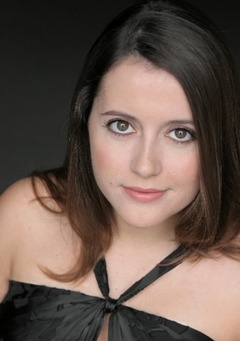 ), a recital by Boston-based harpsichordist Peter Sykes, and an energetic performance by Montreal-based vocal/instrumental quartet Ensemble 1729. 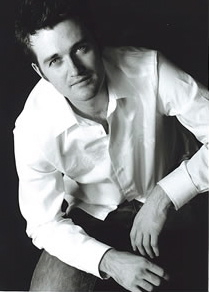 Unfortunately, we were not able to attend the BEMF chamber opera production of Handel’s “Acis and Galatea,” which featured frequent MEMF faculty member Aaron Sheehan (below). Of course we are very, very grateful to our friends Bill and Deb Edmondson and Brian Jones, who made it possible for us to stay the week in Boston at their homes. We are thankful as well for trouble-free and safe travel, as well as for the seasonable Boston weather. Boston’s and Madison’s early music festivals have completely different goals — certainly no one who has participated in a MEMF Workshop would trade that opportunity to work closely for a week with our resident faculty in exchange for a more hands-off concert series with few “egalitarian” educational activities. But the sheer concentration of outstanding performances at BEMF, plus the opportunity to interact with so many professionals and audience members at the Exhibition, makes that festival immensely valuable in its own way.